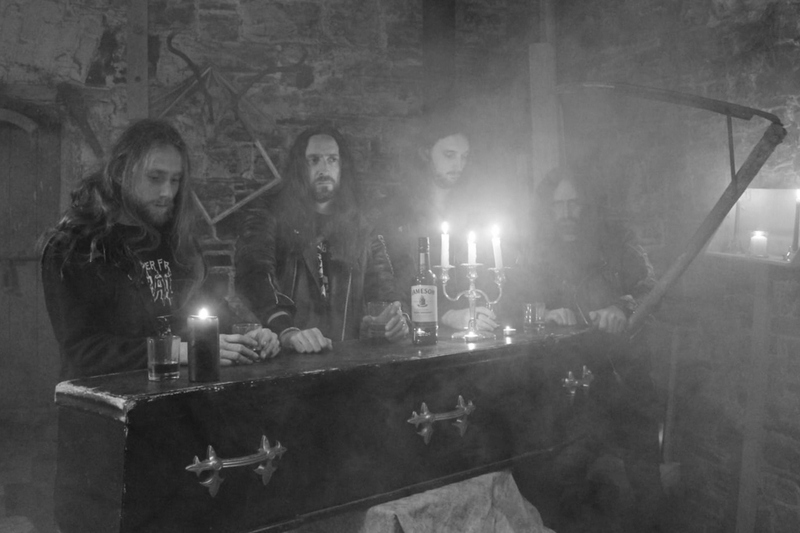 The Irish death metal band Vircolac are in the Meet The Band spotlight this week. They just released their full-length debut album Masque. Guitarist Brendan McConnell introduces us to his band. Chad Bowar: Give us a brief history of Vircolac. Brendan McConnell: The band began in 2013 with Darragh, NH and JG. KB Joined soon after. Some demos were shared around which sparked the collaboration. I was actually living in the UK at the time but I was due to move back to Dublin quite soon. I had purchased the Codex demo while living over there and loved it. Darragh asked me to join as I had known him and NH before I left. I met with the guys and we began writing for what is now The Cursed Travails Of The Demeter. With KB’s departure after Demeter we then recruited JK on bass and began writing for Masque. JK is the only member of the band from Dublin. The rest of us gravitated towards Dublin from completely separate areas of Ireland. Describe the song writing process for Masque. The riffs were all written separately and in some cases were compiled into complete song form before they were brought into rehearsal. Once they are brought in the guys have their input with drums, lyrics and bass if everybody is into it. That is how the majority of it was written. Of course, there were also sections written in rehearsal itself but the idea and general structure of the song was already in place. Once in the studio we are not shy of adding new parts and intricacies to make certain sections more potent. Two I can think of is after we finished recording “Titan” we took a break. We went for lunch and a pint came back and recorded “Tether and Wane” live in one take. This was very much to our surprise as it is the most complex song on the album musically and we expected to spend a lot of time getting it right. The other memory would be the very last day. It was just myself and Ola in the studio finishing up some parts on “So I Hang From A Wretched Tree.” In the creepy middle section of the song there is a lot of whispering and chains rattling. I was also playing the inside of a piano for a while. Very bizarre way to end the recording of a death metal album. There are a few main lyrical themes that run through the album but they all center around the idea that people feel the need to present themselves in a false and deceitful way. It’s almost as though everybody is performing for everybody else which is why the album is called Masque, referring to a Masquerade performance. “Snake Among Man” and the title track touch on this theme most effectively. The first half of the album comes from a position of strength and defiance in the face of adversity. “The Long Trail” is about the Irish soldiers who fought in World War I for a country that caused great pain and suffering to Ireland for hundreds of years. Overall the lyrical themes are quite bleak and dramatic which really help achieve the tone we wanted for the album. How has your sound evolved from your 2016 EP? I would say that the sound spectrum has widened and what I mean by that is every aspect of our sound is pushed a little further. The slow parts are slower, the heavy parts are heavier, the creepy parts are creepier and so on. Also, the album has a much more direct sounding production. The sound is much clearer and sharp with a lot less reverb used overall. We are still very proud of the Demeter EP, but we always look to evolve and improve. How did you come to sign with Sepulchral Voice for Europe and Dark Descent in North America? They were the obvious choice for us as labels. There are so many bands on each that we would be fans of and like to align ourselves with. I believe we had contact to them prior to sending them some material we had prepared for the Demeter EP. Once they received it they expressed an interest in working with us to our delight. That would have been some time in 2016 so I might be missing some details. Hopefully the album will reach out a lot farther than the EP and allow us to go further afield in terms of gigs. We also want to expand our live show to include some new elements and if the album does well we might be able to achieve that. What has been your most memorable Vircolac live show? One that always jumps into my mind straight away is a show we did for the dark arts festival in Galway, Ireland. It was a very small stage and a very energetic crowd. We were due on stage just as people were starting to get a little bit drunker and they were ready for some death metal headbanging! From the very first moment the crowd were singing along, pushing each other forward, drinks spilling, glasses smashing and jumping the stage. Of course we then had to meet that energy and give it back to them. It was great! We have a release show planned for Dublin 13th April where we will be adding some elements to the performance as mentioned earlier. We will be joined by our friends in Sacrilegia and Senzar. After that we have some plans formulating that I can’t give away just yet. Hopefully the album will bring some new opportunities to us also. I found a guitar in the attic of my parents’ house when I was a kid. It was really bizarre I didn’t know what it was or how it got there but I started to play it. A couple of lessons later and trying to play all of my favorite songs I started playing in bands and kept at it ever since. Metallica without a doubt were the first band to make a huge impression on me. I still remember the first time I heard the very first note of Master of Puppets. Me and a friend were sitting in his mother’s car. I must have been 10 or 11. He put on one of his older brothers’ tapes. First song is “Master of Puppets.” I had never heard a distorted electric guitar up to this point. It really was a moment of immediate obsession and then everything else followed. Iron Maiden, Guns ‘N’ Roses, AC/DC, Slayer. Then the inevitable quest for the heaviest band. It wasn’t long until I found Morbid Angel, Deicide and Death. The first concert I ever attended was Metallica in 2003 in Dublin. I was 15 years old, which actually sounds quite late to attend your first concert but I lived in the middle of nowhere at the time and was pretty out of the loop. What’s the extreme metal scene like in Dublin? It’s quite good actually. There are a few great releases recently from Malthusian who just released their debut LP Across Deaths and Sacrilegias debut The Triclavian Advent. There are plenty of really great bands from here like Primordial, Mourning Beloveth, Coscradh, Unyielding Love, Dread Sovereign and Slidhr to name a few. In general the gigs are packed out and there seems to be a real interest in people with what is happening in this relatively small scene. The last thing I watched was Lords of Chaos. It would have been interesting to see a serious take on the story, but that may be too hefty a task. There is so much amazing stuff happening out there at the minute we are spoiled for choice. I’ve been listening to a lot of Taphos, Vassafor, Superstition, Blood Incantation, Obliteratin, Spectral Voice, Malthusian and Tomb Mold. I have also been on an old Deicide buzz for the last couple of weeks. Thank you so much for taking the time to check out the album and hopefully we will see you on the road somewhere!